The bucket mouse trap is the most popular article on Five Gallon Ideas. Since my readers are obviously nuts about trapping, I’ll happily share a few more bucket traps with you over the next couple weeks. Can you guess what this one is? I guess I gave it away already in the title, didn’t I? These simple crab traps are sunk into sand just above the high tide mark on beaches all over the Philippine islands. Trappers sprinkle bits of shredded coconut around the rim – and wait. Just after sundown, the trappers return to harvest their tasty dividends. 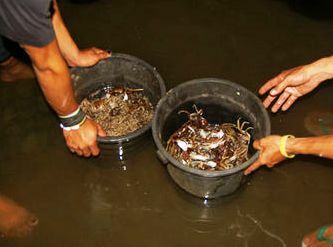 The bucket engineers give their catch a quick wash – in buckets of course – and they’re ready to be fried up for that evening’s meal. 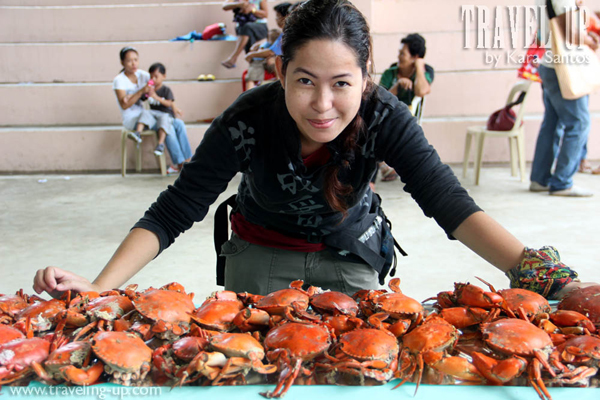 What are little crabs like that worth anyway – $0.50 each? I wonder if this is the most lucrative use for a 5 gallon bucket in the world? Final Thought: This is our 100th post about 5 gallon buckets! I started this site on May 3rd last year. Since then, over 200,000 of you have visited this strange online shrine to buckets, spending a cumulative 17 years here. You don’t mention HOW FAR to sink the buckets in the sand (how much should be above the sand?). The photo appears to show the buckets about five inches above the sand line. How do they get into the bucket, if that is the case? The bucket should be sunk into the sand all the way to its rim so that the bucket lip is flush with the sand. The crabs shouldn’t be doing any climbing at all, only falling. What would be the best location on a beach to place this 5 gallon crab trap? I’m presently in North Carolina…would go to a SC beach area (closer to me). I know a fishing license is needed but would these buckets be allowed instead of traditional wire caged crab pots? While I love this idea, I’m concerned that a person could accidently step inside one and get hurt.